I have four handmade Valentine cards to share with you today and hopefully my finally will not be snooping on my blog and see them before I give them to them. I made all four cards using a new stamp set from MFT. I thought it was such a cute set and I could use the set even when it wasn't Valentine's Day because most of the sentiments in the set are only love related. I did case the cards from Pinterest, and I will link the cased cards to the originals. But as always, when I case a card I make a few changes to make my card my own. First up is this pretty in pink card. You can see the original version HERE. 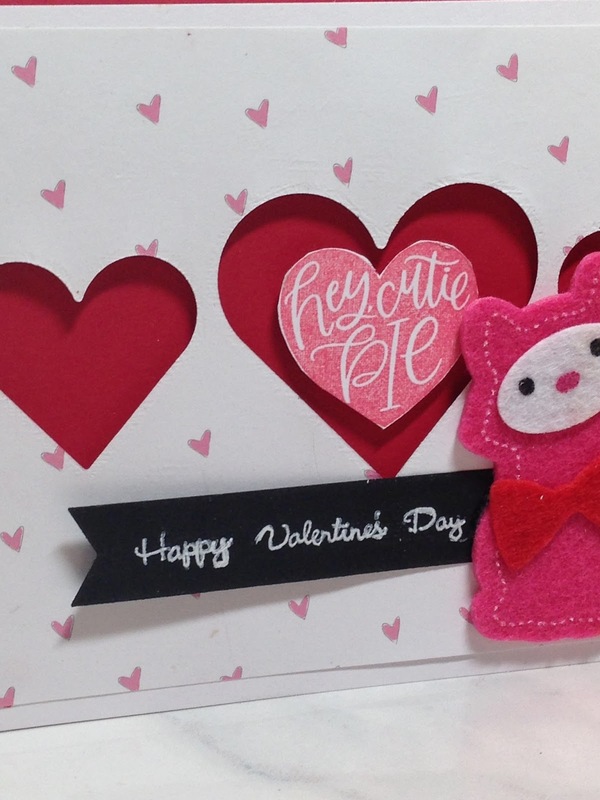 My card uses a brighter, bolder pink for the hearts and different die cuts and sentiments, but the layout is the same. 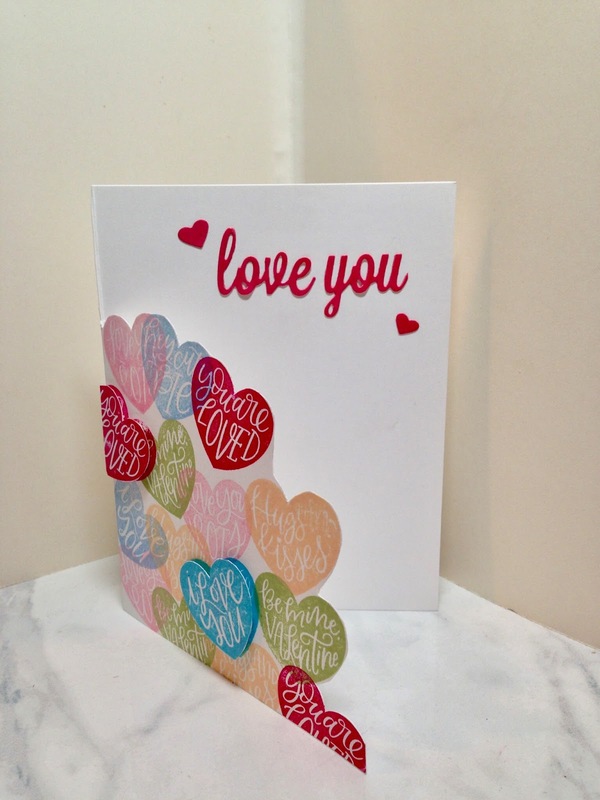 To create this card, I stamped the heart images on white card stock. Then I cut letters out using my Cuttlebug machine and dies. 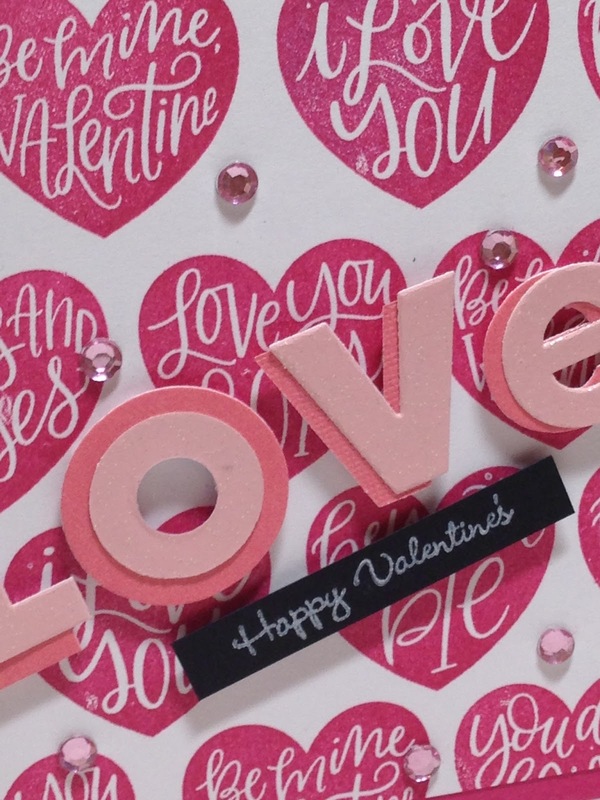 I popped the letters up on dimensionally so they would stand out from the hearts. The sentiment was stamped in white ink on black paper. 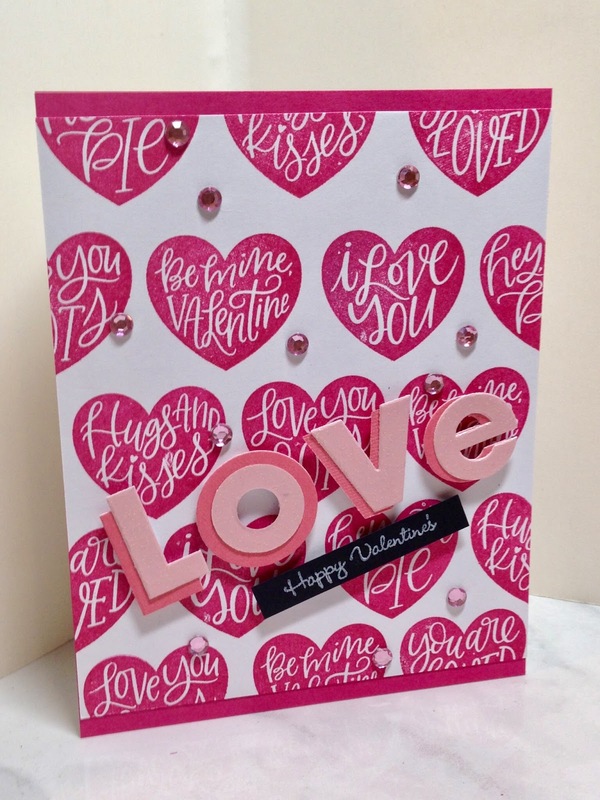 I added pink adhesive crystals throughout the card. My next card was cased from this one HERE. Again, mine is more bold. I used a pinky red card stock for the sentiment, and I stamped the hearts in brighter colors too. I also popped two of my hearts up on dimensionals and I added two tiny hearts near the sentiment. To make this card, after I stamped randomly on the top card base, I just fussy cut around the hearts with a pair of scissors. In the picture below you can see the two popped up hearts very well. 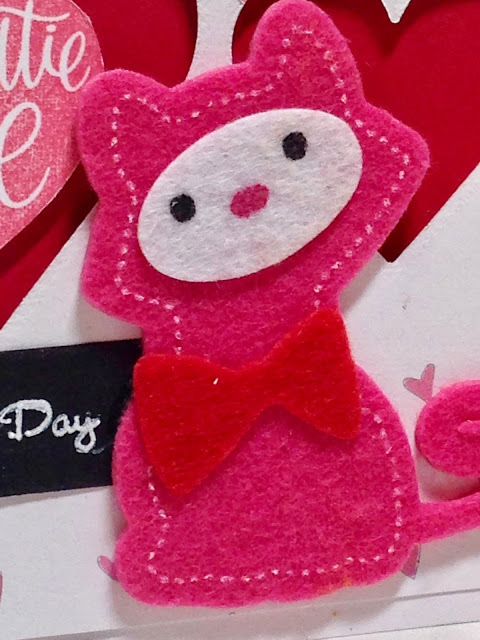 My next card I made for my granddaughter because she loves kitty. I thought she would get a kick out of the cute kitty felt sticker. I cased this card HERE. To make this card I cut heart holes in both the white card stock panel and the pink heart designer paper using a heart die. I glued both pieces over a red card base. I put dimensionals on the white card stock to pop it out from the red card base. 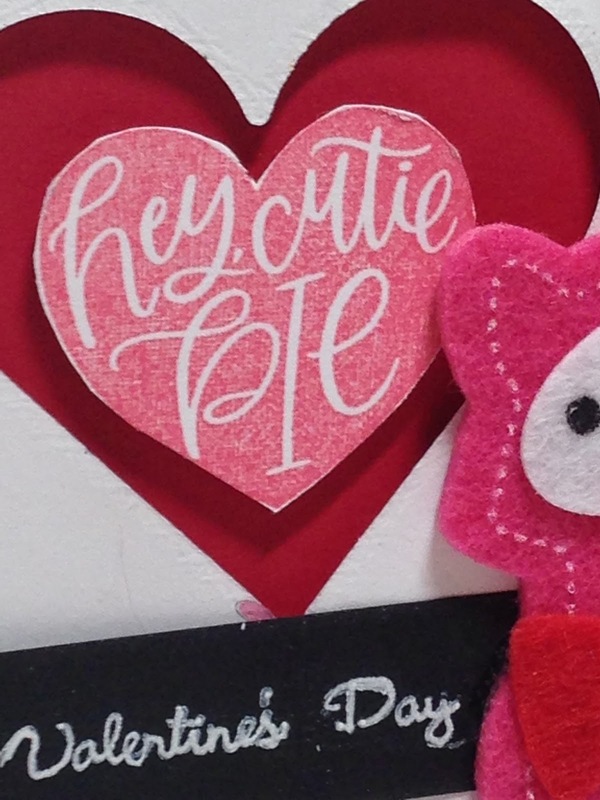 I stamped a "Hey Cutie Pie" heart in pink ink and fussy cut it out then popped it inside the largest heart, up on dimensionals. 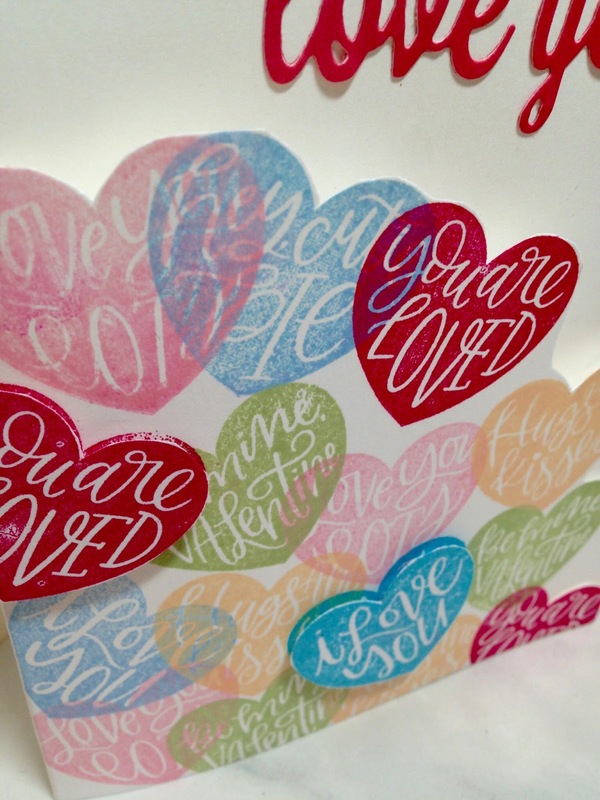 The sentiment was stamped in white ink onto black card stock and then cut out using an MFT banner die. The kitty is just a felt sticker I picked up at a craft store. 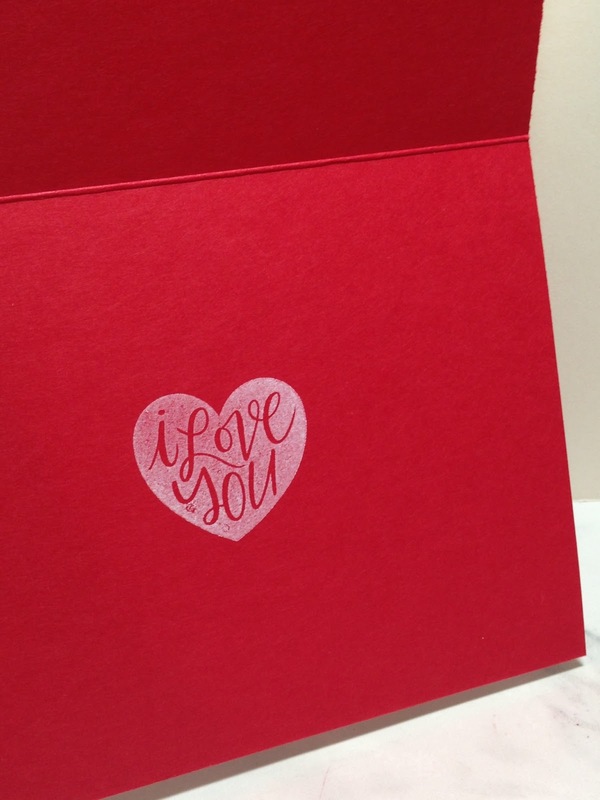 For the inside of Alethea's card, I stamped another heart with white ink. My last card was cased from this card HERE. Again, I just changed the colors and the sentiment using the supplies I have. 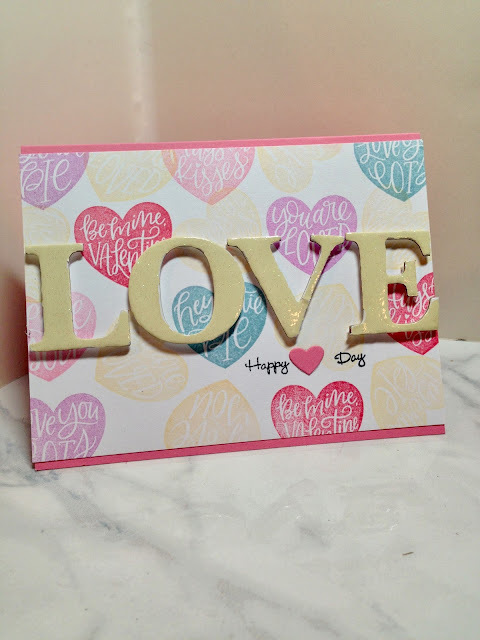 My chipboard love letters were from my stash. I popped them up on dimensionals. I also stamped my background a little different than the original card. I started off trying to copy the original layout, but screwed up, so added more randomly place hearts to hide my mistake. 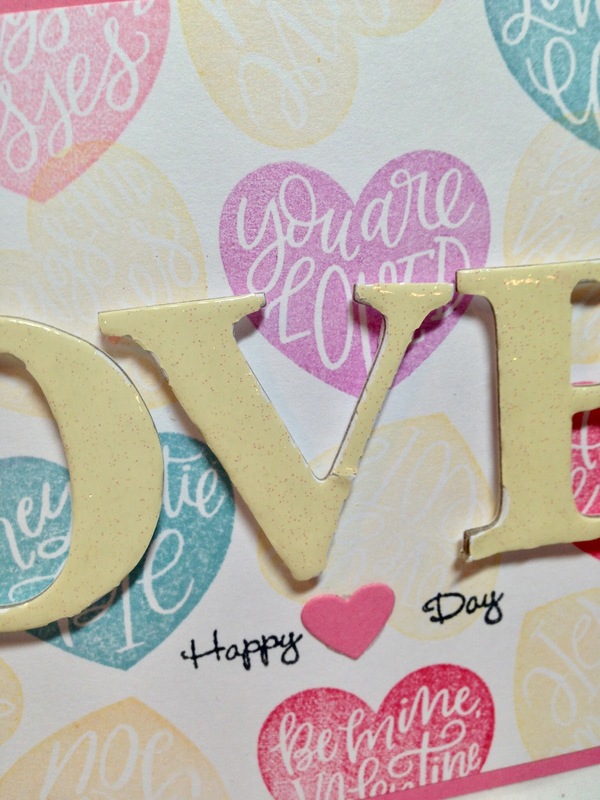 I used a little heart die cut to substitute for the word "heart" in the sentiment. I love adding extra special touches like that. Well if you haven't made your Valentine's Day Cards yet I hope this post inspired you. I look to Pinterest all the time for ideas when I buy a new stamp set and/or need to make cards in a hurry. You don't need to own all the exact items of the original artist, you can substitute with your own supplies. These are lovely! I too make my own cards and often use Pinterest as an idea; but I too change the cards a bit to make them my own (and often to go with the supplies/ colors I have on hand). Pinned each and every one of these pretty cards. Thank you! You're so sweet. And don't you find often when you use your own supplies you like your card better than the one you pinned? I do. 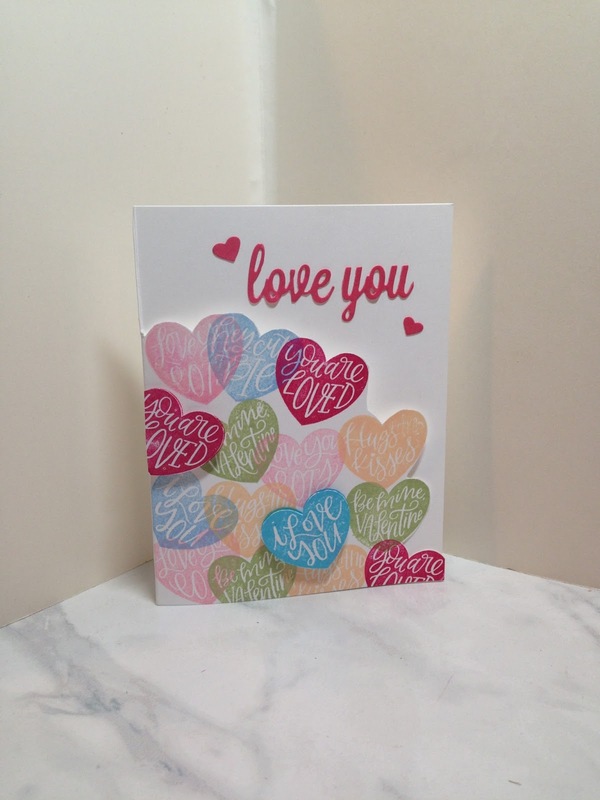 We don't need to buy everything new and we can use what we have on hand to create a similar pretty card ourselves. These are so pretty, and what a fun stamp set! Alethea is going to love the felt kitty! Thanks Ellie! I so rarely buy stamp sets anymore as I have so many already, but this one was very inexpensive and I thought I'd get a lot of use out of it. So sweet and festive, lady! 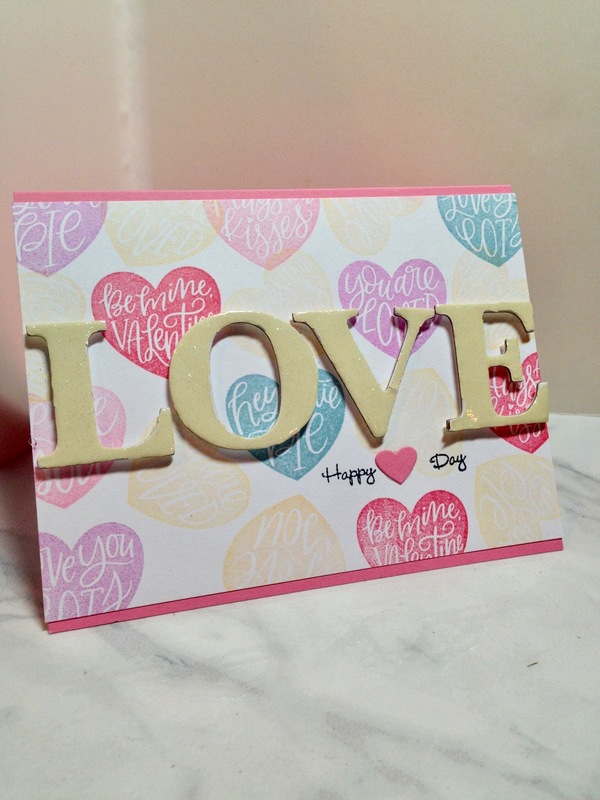 Love your cards- so fun to create different cards like this! Happy Valentines Day! Super excited because I am going to Skype and scrap with my sister on Monday! Have lots of photos ordered and some new papers to play with. I also want to use my Cricut. How are the little hearts with the sentiments made? Do you stamp the hearts, then stamp the sentiments inside the heart? They are just adorable. Remind me of 'conversation heart' candies. Love that you enjoy papercrafts, too. Thanks Leslie! I hope you had fun with your sister. The little hearts with the sentiments is actually a stamp. I just stamp in a color and the sentiment is already there. I bought them from an on line company called "My Favorite Things"